There is absolutely no doubt that Indian E-Commerce Market is growing at a break-neck pace. But, how big will it be 10 or 15 years down the line? According to the recently released Zinnov report, the E-Commerce industry in India has the potential to become a $125 – $260 billion industry. In Indian rupees that equals 6,87,500 crore – 14,30,000 crore. 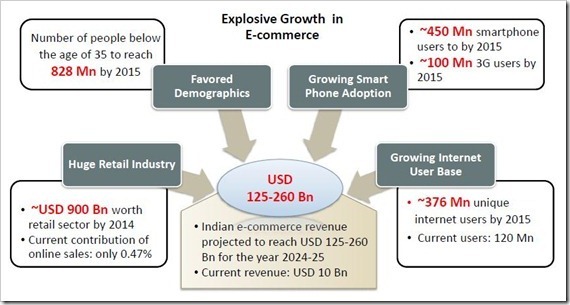 Currently the Indian Ecommerce is estimated to have revenues of about USD 10 billion. Demographics, increase in smartphone users, rapidly expanding internet base and a huge retail industry have been pegged as the key drivers of this future growth story. It is estimated that nearly 65% of India’s billion plus population is below the age of 35. The Zinnov report believes that by 2015, 880+ million Indians below 35 will contribute to the growth of e-commerce in India. Additionally, the spike in smartphone users is also set to play a major role in shaping the rise of e-commerce. We can see how because in a recent survey by Vizisense, nearly 8 out of 10 respondents said that they had done some sort of financial transactions through mobile internet. The Zinnov report also mentions that currently only 0.47% of all the sales in retail industry are made online. However all the other factors, including a growth in the already 100 million plus internet users in India, should propel the e-commerce industry to reach revenues of $125 billion plus within the next decade by 2025. However there are many obstacles that pose solid challenges to Indian e-commerce firms. From a profitability perspective, it emerges that capital intensive e-tailing could demand substantial cash flows to hold more than 3 months of inventory. Logistics also weigh in on margins as delivery costs are estimated to be 5 to 10% of the value of a product. As firms dig deeper into their pockets to acquire new customers by building trust through advertisements and offering higher discounts, there seems to be desperate need to burn cash. There has been much speculation recently that even big players like Flipkart and Myntra will need millions of dollars in funding to fuel growth in the near future. However after record VC spending in 2011, there has been a dip as investors have become cautious. Further insight into the minds of consumers revealed that more than 8 out of every 10 of the 300 respondents of a survey conducted earlier by Zinnov, believed that they could foresee an increase in online purchases. Additionally almost 8 out of 10 respondents had shopped online at least once in the last 3 months, while more than half have done it in the last 30 days. It emerges that social media will also play a pivotal role in driving traffic to e-tailers. 50% of respondents said that they found their way to an e-tailer’s website through social media. Myntra, Jabong and various other e-tailers have already been heavily advertising on social media platforms. Adding to these findings, we also believe that social media presence in India will be something that e-tailers will be looking to tap into. In the west, celebrities and people with a strong influence on social media have already been taking advantage of their presence. Industry experts believe that Kim Kardashian could charge in upwards of $8,000 for a single tweet. In November last year, SMH reported that Charlie Sheen’s tweet drew in excess of 90,000 clicks to the advertiser’s website in just one hour. We’ve talked about the positive perceptions of respondents but what about the skeptics? Will negative sentiments outnumber the positives? In average, not even 1 out of every 10 respondents said that they do not intend to make online purchases. 17% of the respondents did not expect an increase in their e-commerce transactions in the future and 32% said that they were not too keen on using mobile phones to shop online. Apparently, if India Inc echoes the sentiments of the subset surveyed by Zinnov, e-commerce industry could be set to expand on a massive scale. Here is the Full Zinnov Report, that details out India’s Ecommerce growth story of the future. Great work. I am highly obliged that you are sharing current affairs of 2012 of india with us. I really like that you are posting on daily basis and that too with good typical news which I didn’t get from anywhere. Being IAS aspirant at http://www.wiziq.com/course/3822-current-affairs-2012-for-ias-upsc-and-other-exams, I really appreciate your work. Great work. I am highly obliged that you are sharing current affairs of 2012 of india with us. I really like that you are posting on daily basis and that too with good typical news which I didn't get from anywhere. Being IAS aspirant at http://www.wiziq.com/course/3822-current-affairs-2012-for-ias-upsc-and-other-exams, I really appreciate your work.